IN THE OLD WEST, THE MOST POPULAR establishment in town was the saloon. It was the social gathering place. In Downieville, a popular saloon also served as the office of the Justice of the Peace. Saloon regulars often drank straight liquor, such as bourbon or rye. “If a man ordered a ‘fancy’ cocktail or ‘sipped’ at his drink, he was often ridiculed unless he already had a proven reputation as a ‘tough guy,'” according to Saloons of the American West. Now, however, fancy cocktails are the order of the day. And the foothills are home to some delightful craft cocktail lounges, with creative drinks and stylish interiors. Last fall, the Golden Era opened in downtown Nevada City, arguably the most inviting cocktail lounge in the foothills. It is well worth a visit, coupled with dinner, a show, or a weekend getaway to the historic town. Golden Era serves perfect hand-crafted cocktails (with names such as “Miner’s Punch,” “Gold Rush Sour” or “Nevada City Swizzle”), as well as craft beers, local wines and non-alcoholic soda fountain drinks. Weekend music includes piano or soft jazz. A small bites menu is expected this winter. The space harkens back to the Gold Rush era, with a decorative gold tin ceiling, chandelier, Edison lights, and polished wooden floors. A fireplace glows in one seating area, and a fresh rose adorns each table. The bar area is anchored by a Brunswick, Balke, Collender “Record” bar that was made in the mid-1890s in Chicago, and it has been in place since 1904. On our visits, we’ve noticed the lounge attracts patrons of all ages: young people, boomers and retirees. The cocktails, imaginatively prepared with fresh ingredients, are a starting point for conversation. People are talking to each another instead of staring into their smartphones. The swank cocktail lounge is located in the old Cirino’s building at 309 Broad Street, built in 1867. Steve and Cindy, who are longtime locals, have restored and refreshed the Gold Rush-era building, with help from their son Eric and daughter Jessica. Eric and San Francisco mixologist Darren Crawford run the bar program. 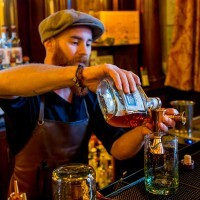 They work for Future Bars of San Francisco, known for stellar bars such as Bourbon & Branch, Rickhouse and Devil’s Acre. 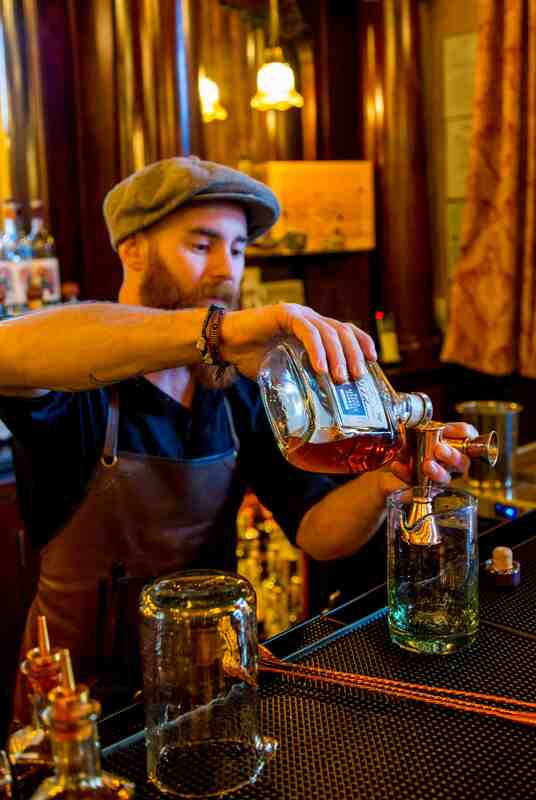 Esquire has named Bourbon & Branch one of America’s best bars. 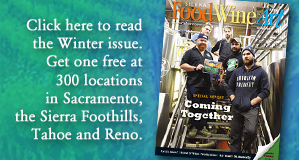 Bar manager Ben Smith was most recently behind the craft cocktail scene at The Porch Restaurant & Bar in Sacramento. Eric and Darren have created the “Miner’s Punch” (pisco, lime, pineapple syrup, Dubonnet and bitters); “Nevada City Swizzle” (rum, pisco, lime, raspberry syrup, Peychaud’s Bitters and seltzer); “Grass Valley Girl” (gin, lime, orange syrup, cucumber, seltzer and orange bitters); and “Gold Rush Sour” (bourbon, lemon, vanilla syrup, orange bitters and egg white), among others. The cocktail syrups are housemade, including vanilla, raspberry, almond and specialty blends. Other ingredients include fresh fruit, vegetables and herbs. Nevada City Winery makes a house red for the lounge called “Golden Era Red Blend.” The draft beer list includes craft brews from Auburn Alehouse. Homemade non-alcoholic drinks are offered too, including root beer, raspberry phosphate and ginger beer.